Even if you happen to be on a tight budget, that doesn’t mean you have to sacrifice your right to online privacy. Fortunately, some of the best VPNs on the market today also offer some of the most budget-friendly payment options. This means that you can enjoy all the benefits of a top-class VPN service at a price that won’t break the bank…we’re talking less than $3 a month! If you’re looking for a cheap VPN that can still provide you with premium security features as well as the ability to circumvent pesky geographical restrictions to watch your favorite shows and movies, then you’ve come to the right place. 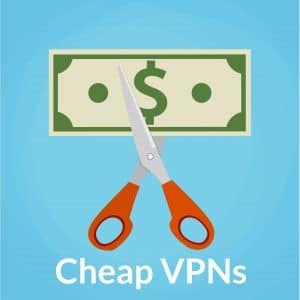 Here at VPN Analysis, our team of experts has tested and analyzed hundreds of VPN services and has curated a list of the five best cheap VPN services for 2019. In this article, we’ll give you a detailed breakdown of our experts’ picks for the five best cheap VPNs currently available, and provide you with some tips on how to get the most out of your VPN. Each of the VPN services listed in this article offer plans that cost less than $3.50 a month! But, although these services come at a low-cost, they offer the most important security features and you really cannot go wrong with any one of them. Let’s dive right in and get started with our in-depth analysis of each one of our expertly-chosen cheap VPN providers. is a cheap VPN service with its headquarters based in Panama – an excellent location for digital privacy. NordVPN provides users with excellent military-grade OpenVPN encryption, an airtight privacy and no logs policy, 6 simultaneous connections and over 5,000 servers in 61 countries. NordVPN, you can rest easy knowing they not only offer a 7-day free trial – but a 30-day money-back guarantee as well. Additionally, CyberGhost provides excellent speeds on most servers, a kill switch, P2P allowance on select servers, Bitcoin payment options and free browser add-ons. If you’re still not sure about trying CyberGhost, you can always take advantage of its 7-day free trial, 14-day money back guarantee on monthly plans, or a generous 45-day money-back guarantee on plans longer than 6 months. In addition to being excellent at unblocking content, PrivateVPN also offers amazing connection speeds for streaming. Not to mention that the app is incredibly easy to use for less tech-savvy users. A downside to PrivateVPN – you have to manually configure the DNS via a provided guide. Fortunately, the guide isn’t hard to follow at all. If you’re unsatisfied for any reason, you’re backed by PrivateVPN’s no-hassle 30-day money-back guarantee. Or, you can try it out for free thanks to PrivateVPNs 7-day free trial. Additionally, PIA provides DNS leak protection, a kill switch, and P2P support. A downside to PIA – they’re based in the US. This means if they were served a warrant, they’d have to comply. This is where their no logs policy comes in – they might have to comply, but there’s not much they can offer up. Finally, PIA does offer a 7-day money-back guarantee for unsatisfied users. PureVPN is a cheap VPN service that offers an impressive network of servers and server locations (2,000+ servers in 140+ countries) – which also makes PureVPN an excellent choice for streaming content worldwide. PureVPN also provides users with five simultaneous connections, a killswitch, split tunneling, secure encryption, and excellent connection speeds. On top of that, PureVPN allows P2P activities on select servers, no usage logs, NAT firewall, 24/7 customer support, dedicated IPs and advanced port forwarding. A downside to PureVPN is the number of connection logs that are stored. If you end up unsatisfied with PureVPN, you can request a refund with PureVPNs 31-day money-back guarantee. Take a look below for some of the most common questions that are asked about using a cheap VPN and any questions you may have about VPN services in general. A VPN (virtual private network) is a tool that provides online privacy to its users by encrypting the user’s internet connection through a secure tunnel to a remote VPN server location. When you connect to a VPN server, all of your internet activity is encrypted and hidden from hackers, government agents, your ISP, and anyone else looking to snoop on what you’re up to online. Furthermore, when you connect through a VPN, any website you visit will register the IP address and location of the VPN server you are connecting through, rather than your own IP address and location. What can VPNs be used for? Accessing geographically restricted content such as Netflix, Hulu, Amazon Prime, BBC iPlayer, etc. The overall cost of a VPN can vary greatly from provider to provider, depending on what each VPN service offers its customers. A premium, fully-featured VPN service will generally cost more than a VPN service that simply offers the basics. For example, a premium VPN service can run you anywhere from $70/year up to even $100/year. The good thing is that you can still get a secure, high quality and fully-featured VPN service at a much more affordable rate. Some providers offer longer-term plans that will cost you around $100 for a 3-year subscription, for instance. All of the providers listed in this article offer highly affordable payment plans and excellent features that really give you the proper bang for your buck. If you’re looking for a free VPN service, it’s important to note that many of them are insecure, unreliable and can’t unblock Netflix or iPlayer. However, there are some free VPN services that can be trusted. See here for a list of trusted VPN providers that are free. Yes, a cheap VPN can absolutely be safe to use. In fact, there are many quite expensive VPNs on the market today that cannot be considered particularly safe. As with many other products, it’s not always the case that the price correlates directly with the quality of the service when it comes to VPNs. By the same token, it’s fair to mention that there are many cheap VPNs available that aren’t safe either. The main thing to look out for when considering the safety and security of a VPN provider is not necessarily the price of the service, but rather the quality of the security features offered by the provider. A safe VPN should offer its users solid, military-grade encryption protocols, collect no logs, and provide additional security features like a kill switch and DNS leak protection to ensure your privacy. There are certainly cheap VPN providers available that incorporate these safety and security standards, and we can confidently affirm that each of the providers listed in this article fits the bill. If you’re in a country, such as China for example, with strict internet censorship tactics and government firewalls, then you may find it difficult to establish or maintain a stable VPN connection. Some VPN providers are unfortunately not properly equipped to evade government firewalls in such countries. Additionally, governments in countries like China and the UAE are doing everything they can to ban unauthorized VPN use to bypass their internet censorship tactics. Are Cheap VPN services Fast? Yes, a cheap VPN service can absolutely be fast. In fact, each of the VPNs we list in this article offers outstanding connection speeds. If you’re not getting quite the speeds you are looking for, often you’ll be able to experience an improvement in connection speeds by simply switching servers and finding one that suits your need for speed. Keep in mind that, generally speaking, the servers located closest to your actual physical location will typically offer the fastest speeds. When it comes to purchasing a VPN, you’ll typically be presented with about 3 or 4 different payment plan options. Here, we’ll give you a quick rundown of what to expect from the different types of payment plans generally offered by most VPN services. Monthly VPN payment plans are usually offered in a variety of different lengths. Some of the most common billing intervals include month-by-month billing, semi or bi-annual plans which are billed every six months, yearly plans billed once a year, two year plans billed every other year, and even three year plans billed every three years. Naturally, the cheapest VPN plans are longer, as it’s calculated on a monthly basis. So if you are looking to get the cheapest monthly VPN rate, then your best bet would be to go with the longest subscription plan your VPN of choice offers. This way, for example, if you choose a three-year subscription plan, that means you can typically get your VPN at a rate of under $3 a month. Some VPN providers offer lifetime VPN plans, meaning that you pay once and you have full access to the VPN for life, so lifetime plans may look like a great option for those looking for a cheap VPN. The primary and obvious advantage to a lifetime VPN plan is that for a slightly higher one-time payment, you could potentially get unlimited VPN access for the rest of your life. That is, however, where the advantages to lifetime VPNs end. While it may seem like a great deal on the surface, once you’ve paid for your lifetime subscription, the VPN provider has little incentive to retain you as a happy customer since they already have your money. This means that your customer service experience will likely suffer, and you could very well find the VPN software itself to be unstable because there wouldn’t be much of a reason to put much effort into proper network upkeep. Furthermore, who says the service will be in business forever? Any service offering a lifetime subscription plan can simply close up shop at any time and you could be suddenly left without any VPN service at all. In truth, you would be better off going with a longer-term renewing subscription plan with a reputable VPN service, which would cut down on your overall costs in the long run and save you from any potential frustration dealing with a sub-par VPN provider. Some VPN users may think that going with the most expensive VPN service will automatically grant them the best possible VPN experience just by virtue of the high price tag. As we have seen here in this article, that is not necessarily the case. Many of the top VPN providers in the game today also offer some of the most affordable payment options. This means that you can absolutely get a cheap VPN that is at the same time of superior quality. Since our experts have thoroughly tested and endorsed the quality of each provider listed in this article, we can certainly attest to that fact. This article is quite informative and I find it really helpful. Plus I would say in this regard that although your recommended list of VPN is great but what I actually like here most is my all-time favorite and economical PIA. It just costs me $ 39.95. I’ve using it since couple of months and find it absolutely cheap, reliable and secure VPN service. I read your article and was glad to see my preferred best cheap VPN leading the list. I would personally recommend people to subscribe to the annual package of the VPN. This will save you from hassle of renewing your subscription monthly and even gives you the possibility to avail larger discounts.